Graduals were books containing the music for the Mass. They were often very large, so that several members of the choir could gather around a single copy. Since new compositions of plainchant appeared constantly, old graduals were often scrapped and their parchment recycled when they became antiquated. The item on display is all that remains of one of these books. 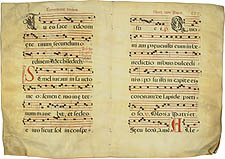 The music on the two pages is discontinuous because four leaves from the center of the quire have been lost. The lost leaves may have contained lavish artwork, as graduals often did, and are likely to have been thrown away after they were mutilated. The exhibit case at the end of the hall contains examples of artwork removed from graduals.